The CREATE Institute Expressive Arts training program provides a theoretical basis in the field of Expressive Arts Therapy, while familiarizing students with those elements of therapeutic practice common to all approaches. As well as theory, we emphasize experiential learning, in which students are encouraged to explore the different dimensions of artistic practice in community and in individual studio work. We especially encourage intermodal work in our classes and workshops. We also stress an adult-education model where students are recognized as having the capacity to understand and shape their own learning process. Students are expected to be self-directed in their learning, to work through the obstacles that may interfere with their training and to discover the resources that can help them learn. To this end, students are required to be in expressive arts therapy during their enrollment in the program. 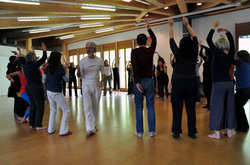 In the first two years, students attend classes one evening a week and also attend several weekend intensive workshops. _Each year begins with a gathering of the whole programme for an Intensive Community event; and the third year ends with a Graduation Weekend. Two weekends per year are devoted to the sharing of Studio Work. 250 hours are spent in direct client contact. 350 hours are spent in * supervision, planning, presentations and other activities related to the placement. * 80 hours of supervision must be completed within the 600 hours. For more information on Practicum click here. 3. Expressive Arts Therapy with a therapist approved by the Training Directors. 90 hours of therapy are required for completion of the three year program. For those entering the program with a strong therapy relationship in place, CREATE offers a transition time of 30 therapy hours to stay with that therapist before completing the remaining required hours with an intermodal expressive arts therapist. For all others, a minimum of 90 hours of individual therapy must be with an intermodal expressive arts therapist. Students pursue studio work in the arts and present this work to the community once a year. a total of 300 hours are required to complete the three year program. For a list of Recommended Readings click here. For more information on Further Study click here. "CREATE learning promotes self awareness and individual growth, to allow for a higher understanding of human experiences through creative arts expression. Training at CREATE Institute is a journey into the unknown, uncovering each individuals ability to heal and grow through ones own knowledge in body, mind and soul awareness’s using the arts. It motivates and encourages new discoveries of healing.